FRANCE: Alstom will go ahead with building two factories at Cherbourg, manufacturing blades and towers for the Haliade 6MW turbine. Doubts had been raised over the plans for the two factories following the takeover of Alstom's power division by GE, approved by the EC in September. The company is now waiting for a firm order from Eolien Maritime France (EMF), the consortium led by EDF Energies Nouvelles which is developing the Courseulles-sur-Mer, Fecamp and Saint Nazaire offshore projects, to be equipped with a total of 238 Haliade 6MW turbines. EMF expects to place the orders in late 2016 or early 2017 at the earliest, if it receives the authorisations to build the projects early 2016 and there are no appeals. Alstom said in January it planned to start building the factories this year. The blade factory, which is fully permitted, will be built in partnership with LM Wind Power. Alstom says "several options are currently under study" as to who will own the facility. At the same time EMF has also chosen Cherbourg to serve as the logistics hub for both the Courseulles-sur-Mer and Fecamp projects. 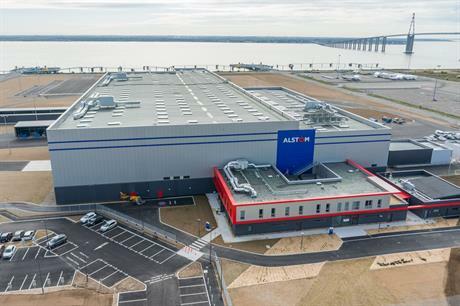 In December 2014, Alstom opened the Saint Nazaire factory, used to manufacture nacelles for its Haliade turbine.